According to the Culpeper Police Department, officials received a report in the middle of the night on Feb. 1 that the Culpeper Pregnancy Center had been vandalized. 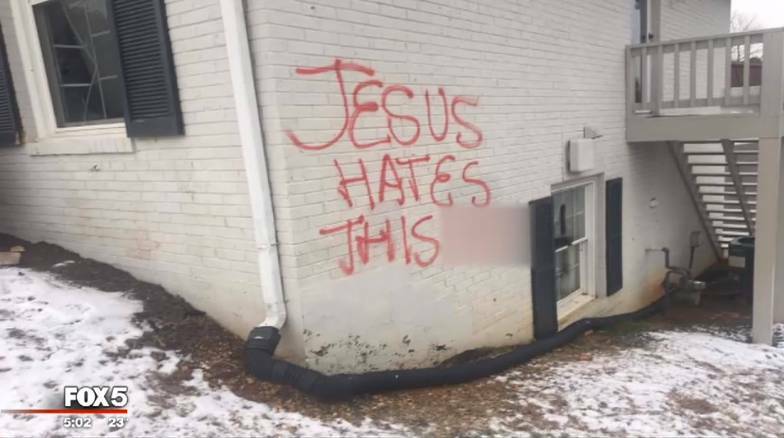 Police arrived on the scene to find the location defaced with red and black spray paint, both on its main sign and the exterior of the building. A window was also smashed. The pregnancy center is one of four locations run by The Pregnancy Centers of Central Virginia. The organization had just celebrated its 35th year in the fall. Dr. Karen Poehailos rotates her time between the various locations, serving as the physician for The Pregnancy Centers. Services are free and include pregnancy testing, ultrasounds, counseling, baby supplies, referrals for adoption, housing, and financial assistance. Parents may also participate in classes that teach the fundamentals of caring for an infant. “We do not profit from your decision in any way. We are here solely as a resource for you,” the website for the organization reads. Police are now seeking information on who vandalized the Culpeper location last week. “We encourage anyone who may have been in the area or noticed anything suspicious … to reach out to our detectives to assist with bringing the person(s) responsible for this crime to justice,” the department said in a statement. D.J. Carter, the president of The Pregnancy Centers of Central Virginia, said that he views the attack as an opportunity to let others know about the center’s offerings, and to pray for those who acted out maliciously against the ministry. “Instead of being angry, we’ve rejoiced this is an opportunity for us to talk about what to do and we also pray for the individuals who attacked us in this way,” he told Fox 5 News. The situation occurred during a week of much talk about an abortion “rights” bill that had been presented by Virginia Del. Kathy Tran, D-Fairfax, which she admitted would have allowed for a mother to obtain an abortion even up to the time of labor due to “mental health” reasons. Tran, appearing uncomfortable, responded that the matter would be up to the attending physician. Gilbert interjected that he was rather wondering if Tran’s bill would allow for such a situation. “My bill would allow that, yes,” she acknowledged. Republicans consequently killed the bill in committee, keeping it from moving forward in the legislature.